Context: Periodontitis is an inflammatory disease of microbial origin. Locally delivered antimicrobials reduce subgingival flora. Achyranthes aspera gel has antimicrobial, antioxidant, anti-inflammatory, and immunostimulant effects. Aims: To evaluate the efficacy of local drug delivery of A. aspera gel in the management of chronic periodontitis. Materials and Methods: Thirty patients with chronic periodontitis were considered in the study and categorized into two equal groups (Group A: scaling and root planing (SRP) with A. aspera gel, Group B: SRP with placebo gel). Patients were enlisted from the Department of Periodontics, Mamata Dental College and Hospital. The clinical parameters (gingival index, bleeding on probing, probing pocket depth, and clinical attachment level) were recorded at baseline and 3 months. Statistical Analysis Used: All the obtained data were sent for statistical analyses using SPSS version 18. Results: The periodontitis and the Achyranthes were statistically analyzed. A comparison of clinical parameters for test group and control group from baseline to 3 months was done using paired t-test. Intergroup comparison for both the groups was done using independent sample t-test. Conclusions: A. aspera gel when delivered locally along with SRP showed a beneficial effect. A. aspera gel as a non-surgical local drug delivery system proved to be without any side effects in the management of periodontitis. A. aspera gel has strong anti-inflammatory effects in addition to its antioxidant activity. In the 21st century, herbal plants are gaining its place back by substituting modern drugs all over the world. This drastic changeover is due to the irreversible damage caused by modern drugs. The advantage of herbal plants over modern drugs is that they usually consist of several phytochemical components, including flavonoids and alkaloid compounds. Achyranthes aspera is an important herbal remedy used most commonly in allied medicine, as it has various pharmacological properties such as antimicrobial, analgesic, antipyretic, anti-inflammatory, immunostimulant, antioxidant, antifertility, hypoglycemic, diuretic, hypolipidemic, cardiac stimulant, antihypertensive, antinoiceptive, prothyrodic, antispasmodic, and hepatoprotective properties. Periodontitis is an array of inflammatory diseases of microbial origin mainly composed of Gram-negative anaerobic bacteria. The etiopathogensis of these diseases influences the interaction between bacterial agents, environment, and the host defense mechanisms to the microorganisms. The development of “specific plaque hypothesis” has led to newer treatment modalities which aim at suppressing or eliminating the specific periodontal pathogens. Putative pathogens causing periodontal diseases are sensitive to a variety of antiseptics and antibiotics. The existing treatment approaches in the management of periodontal diseases aim at targeting specific micro-organisms and thereby help in the modification of the destructive host defence mechanism. The success of conventional mechanical periodontal treatments depends on the day-to-day patient's oral hygiene maintenance and supplement use of systemic antimicrobial agents helpful in treating recurrent periodontal pockets. A total of thirty patients were enlisted from the Department of Periodontics, Mamata Dental College and Hospital, Khammam, with clearance from ethical committee and followed by informed consents from all the patients who participated in the study. Healthy patients diagnosed with chronic periodontitis (probing pocket depths [PPDs] ≥5 mm) and individuals who can maintain satisfactory oral hygiene after the initial treatment were included in the study and patients diagnosed with aggressive periodontitis, pregnant and lactating females, smokers, and patients under antibiotic therapy or who underwent periodontal therapy in the last 6 months were excluded from the study. A stent was manufactured to measure the periodontal probe depth before and after the treatment. It is designed to reach the same position before and after the treatment, thus avoiding errors during treatment protocol. Group B (control): 15 patients who were treated with only SRP. Followed by a complete supragingival scaling, proper oral hygiene instructions were given to the individuals and customized stents were designed for the region where the plant preparation has to be delivered for the standardization of the values throughout the study. The following clinical parameters such as gingival index (GI), PPD, and clinical attachment level (CAL) were assessed at baseline before SRP and local drug delivery of A. aspera gel in Group A and before SRP alone in Group B and then again at 3 months after the treatment. A. aspera powder was obtained from the pure root extract of the plant and an aqueous-based gel was prepared, which consists of the following proportions: A. aspera powder 4 g, gelatin 12 g, glycerin (wetting agent) 0.2 ml, peppermint oil (flavoring agent) 0.1 ml, sodium saccharine (sweetening agent) 0.1 ml, and purified water qs 100 ml. All the ingredients were homogenized using a homogenizer to obtain the gel [Figure 1]a and [Figure 1]b. Following a complete SRP and irrigation with saline in both the groups, A. aspera gel was locally delivered into the periodontal pockets in Group A patients with the help of a blunt cannula of syringe. Patients were advised not to chew hard, sticky foods and brushing or use of interdental aids was also avoided at the drug-delivered site for a week [Figure 2]a and [Figure 2]b. All the required data were obtained and sent for statistical analyses using SPSS version 18.0 IBM SPSS (IBM Inc. Chicago). A statistically significant P < 0.05 was considered. A comparison of clinical parameters for the test and control groups from baseline to 3 months was done using paired t-test [Table 1] and [Table 2]. Intergroup comparison for both the groups was done using independent sample t-test [Table 3]. The clinical parameters such as GI, probing depth (PD), and CAL after statistical analysis showed a significant reduction from baseline to 3 months. The mean GIs in the test and control groups at baseline were 2.60 and 2.57, respectively, and after 3 months were 1.35 and 2.32, respectively, which showed statistically significant results (P < 0.001). The mean PDs in the test and control groups at baseline were 5.16 and 4.44, respectively, and after 3 months were 2.92 and 4.10, respectively, which showed statistically significant results (P < 0.001). 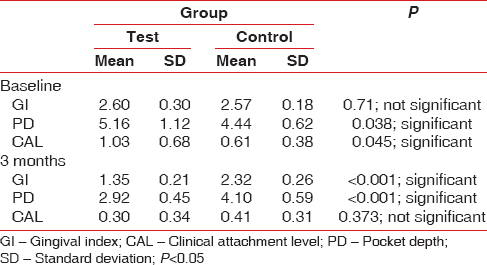 The mean CALs in the test and control groups at baseline were 1.03 and 0.61, respectively, and after 3 months were 0.30 and 0.41, respectively, which showed statistically significant results (P < 0.001) [Table 1]. The intergroup comparison between the groups results showed that the mean GIs in the test and control groups at baseline were 2.60 and 2.57, respectively, which were nonsignificant, and after 3 months were 1.35 and 2.32, respectively, which showed statistically significant results (P < 0.001). The mean PDs in the test and control groups at baseline were 5.16 and 4.44, respectively, and after 3 months were 2.92 and 4.10, respectively, which showed statistically significant results (P < 0.001). The mean CALs in the test and control groups at baseline were 1.03 and 0.61, respectively, which showed statistically significant results (P < 0.045) and after 3 months were 0.30 and 0.41, respectively, which were statistically nonsignificant [Table 2]. The clinical parameter difference in both the test and control groups from baseline to 3 months showed that the mean GIs in the test and control groups were 1.25 and 0.25, respectively, the mean PDs in the test and control groups were 2.24 and 0.34, respectively, and the mean CALs in the test and control groups were 0.73 and 0.20, respectively, which showed statistically significant results (P < 0.001) [Table 3]. According to several studies, mechanical debridement alone cannot completely eliminate all periodontopathogenic bacteria from the subgingival environment. In cases with the presence of bacteria in inaccessible areas such as furcation area, root concavities, and deep periodontal pockets, these local delivery of antimicrobial agents can work effectively. The major advantage of using local drug delivery at the target site includes achieving high intrasulcular concentration. Various herbal agents have been used for the management of periodontal diseases. As per our knowledge, none of the clinical studies were reported in the literature which evaluated the efficacy of the local drug delivery of A. aspera plant extract for the management of periodontal diseases. A. aspera is a medicinal plant and many traditional healers used it for the management of fever, asthma, hypertension, dysentery, diabetes, cough, bronchitis, and rheumatism. As per Ayurveda, it is bitter, pungent, heating, and laxative and used for the management of vomiting, bronchitis, heart disease, piles, itching abdominal pains, dyspepsia, dysentery, and blood diseases. Roots of A. aspera contain alkaloids, flavonoids, saponins, steroids, terpenoids, and ecdysterone. The success of any periodontal treatment is measured using two important clinical parameter values such as decrease in PPD and gain in CAL. In the present study, PPD was decreased in both the groups, where Group A (test) showed a decrease from 5.96 to 2.92 mm and Group B (control) from 4.44 to 4.10 mm at the end of 3 months. Comparing PPD in both the groups revealed statistically significant results. CAL evaluated in both the groups showed a gain from 1.03 to 0.30 mm in Group A and from 0.61 to 0.41 mm in Group B. On comparison, Group A showed a greater gain in CAL after 3 months. The variation in the clinical parameters of the present study are due to the soft-tissue wall changes caused by the resolution of gingival inflammation. The antioxidant property of A. aspera results in terminating the radical chain reaction by inhibiting free-radical quenching and high levels of phenolic compounds in the ethyl acetate extracts which may have partly contributed to the antioxidant activity. Anand et al. reported that extracts of the plant showed potent antioxidant activities. Edwin et al. reported the antioxidant properties of the ethanolic and aqueous extracts of plant, which were assessed using 2,2-diphenyl-1-picrylhydrazyl radical scavenging activity and superoxide scavenging activity. Kumar et al. reported the analgesic activity of the hydroalcoholic extract from roots and leaves of A. aspera in adult male albino rats, using doses of 200 and 400 mg/kg. The maximum analgesic activity was seen at a dose of 400 mg/kg. Kumar et al. reported the anti-inflammatory activity of alcoholic extract from roots of A. aspera in Wister rats. Phosphate-buffered saline extract of A. aspera had displayed immunostimulant action as stated by the promotion of T-lymphocyte proliferative responses. Therapeutic approaches with herbal medicine are often alternative due to lack of data with meticulous clinical trial evidence. It is recommended that more researches should be undertaken. A. aspera gel as a nonsurgical local drug delivery system in periodontal disease patients after thorough SRP has shown acceptable results with good prognosis without any side effects. A. aspera gel has various pharmacological properties with strong anti-inflammatory effects and its antioxidant activity. However, further studies with large sample size are required to evaluate the efficacy of A. aspera gel in the management of periodontal disease patients. Van Wyk BE, Wink M. Medicine systems of the world. In: Ferreira R, editor. Medicinal Plants of the World. 1st ed. South Africa: Briza Publishers; 2004. p. 43. Pande PC, Tiwari L, Pande HC. Ethnoveterinary plants of uttaranchal – A review. Indian J Tradit Knowl 2007;6:444-58. Lai PK, Roy J. Antimicrobial and chemopreventive properties of herbs and spices. Curr Med Chem 2004;11:1451-60. Ali M. Chemical investigation of Achyranthes aspera. Lin. Orient J Chem 1993;9:84-5. Srivastav S, Singh P, Mishra G, Jha KK, Khosa RL. Achyranthes aspera – An important medicinal plant: A review. J Nat Prod Plant Resour 2011;1:1-14. Haffajee AD, Socransky SS. Microbial etiological agents of destructive periodontal diseases. Periodontol 2000 1994;5:78-111.
van Winkelhoff AJ, Rams TE, Slots J. Systemic antibiotic therapy in periodontics. Periodontol 2000 1996;10:45-78. Rams TE, Slots J. Local delivery of antimicrobial agents in the periodontal pocket. Periodontol 2000 1996;10:139-59. Francetti L, Trombelli L, Lombardo G, Guida L, Cafiero C, Roccuzzo M, et al. Evaluation of efficacy of enamel matrix derivative in the treatment of intrabony defects: A 24-month multicenter study. Int J Periodontics Restorative Dent 2005;25:461-73. Goodson JM, Hogan PE, Dunham SL. Clinical responses following periodontal treatment by local drug delivery. J Periodontol 1985;56 11 Suppl:81-7. Lakshmi T, Geetha RV, Ramamurthy JG, Anand VA, Roy A, Vishnupriya VS, et al. Unfolding gift of nature – Herbs for the management of periodontal disease: A comprehensive review. J Pharm Res 2011;4:2576-80. Dwivedi SN, Satyaendra S, Sangeeta D, Abhishek D, Sumeet D, Shefali K. Relevance of medicinal herbs used in traditional system of medicine. Farmavita Net 2007;1:1-5. 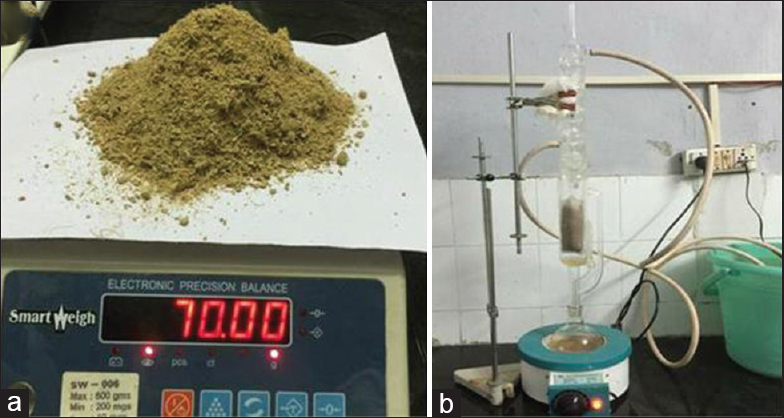 Anand M, Selvaraj V, Alagar M. Phytochemical screening and evaluation of (In-vitro) antioxidant activity of Achyranthes aspera Linn root extract. Int J Pharm and Pharmaceutical Sciences 2014;32:192-7. Ishikawa I, Baehni P. Non-surgical periodontal therapy – Where do we stand now? Periodontol 2000 2006;36:9-13. Lotito SB, Frei B. Consumption of flavonoid-rich foods and increased plasma antioxidant capacity in humans: Cause, consequence, or epiphenomenon? Free Radic Biol Med 2006;41:1727-46. Edwin S, Jarald E, Edwin DL, Jain A, Kinger H, Dutt KR, et al. Wound healing and antioxidant activity of Achyranthes aspera. Pharm Biol 2008;46:824-8. Kumar H, Singh D, Kushwaha SK, Gupta AK. Comparison of leaf and root extract of Achyranthes aspera for its analgesic activity. Pharm Lett 2009;1:193-8. Kumar SV, Sankar P, Varatharajan R. Anti-inflammatory activity of roots of Achyranthes aspera. Pharm Biol 2009;47:973-5. Vasudeva RY, Duddukuri GV, Sunil BG, Athota RR. Immunomodulatory activity of Achyranthes aspera on the elicitation of antigen-specific murine antibody response. Pharm Biol 2002;40:175-8. Agrawal N, Gupta R, Gupta I, Mehrotra V, Roopa DA. Herbcraft: Boon to the periodontal therapy. Int J Dent Health Sci 2014;1:47-62.